Built in 1818, the Custom House is typical of the Federal style of building. 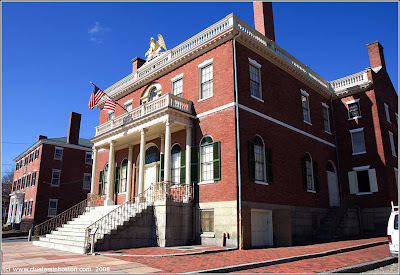 However, the building is more noted for one of its employees, Nathaniel Hawthorne, the author of the Scarlet Letter and The House of the Seven Gables. Beautiful light and perspective in this photo! Very nice. Did you get a chance to photograph any witches?